He asks: can we leverage semiconductor technology to address global challenges of environment, energy, healthcare, and water? Others have made a compelling argument that the requirements are totally different. In particular, his IBM colleague Winfried Wilcke presented at the 2011 SPIE conference a comparison between VLSI and emerging energy technology requirements in the areas of materials, pattern control, device size, chemical processes during operation, big internal surfaces, and membranes. For each requirement there was a large difference between VLSI and energy. One example is that VLSI semiconductors do not involve chemical processes during operation while batteries and fuels cells do. Innovation beyond transistor scaling is now required (More than Moore) as scaling itself is no longer sufficient. Beyond the 32 nm node performance starts to decrease – clearly not what the industry is used to based upon Moore’s Law. These innovations have been and will be in many other technology areas (packaging, stacking, materials, etc.) that may be transferable to non-semiconductor domains. There is significant experience working with new materials on a nano-scale. Prior to 1990 there were only seven materials used in semiconductor processing. Now nearly the entire periodic table is used. “Directed Self Assembly” of polymers convert random structures into controlled structures while avoiding cost prohibitive photolithography tools. His examples shown illustrate double, tripling, and quadrupling of line density with existing 193 nm photolithography using self assembling polymers. These structures are also self healing – “autonomously” fix gaps and defects in the lines. He also noted that chemical amplification of materials has been the basis of resist systems both in the Environmentally Stable Chemically Amplified Photoresist (ESCAP) regime (1994-2002 down to the 130 nm node) and FARM (Immersion) 193 nm litho (2003-present down to 45 nm). In short, we have developed the capability to design new functional materials. At the same time we have closed the loop between Experimental and Computational research for material science. Computer models are being used to direct and accurately predict physical (experimental) research prior to experimentation not just explain experimental results after the fact. This new “Computational Materials Science” has enabled the development of these new materials on the nano-scale. 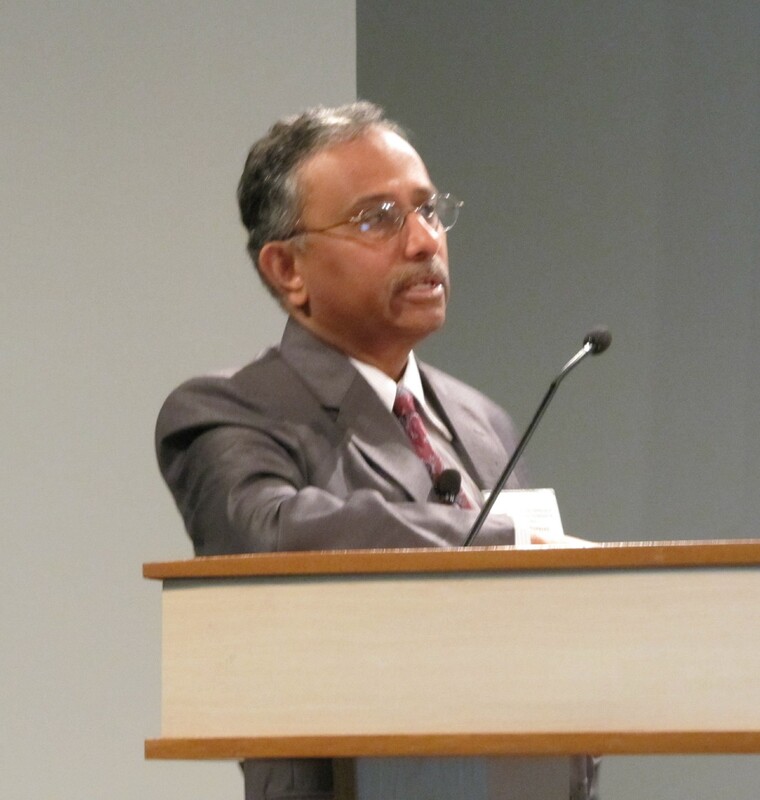 “Where two different areas converge that is where innovation occurs,” said Dr. Narayan. Currently 70% of the new patents related to nanotechnology for medical and pharmaceutical use originate outside the pharmaceutical industry. This work is being done by “outsiders” with backgrounds in semiconductor, nanotechnology, and other areas. In addition pharmaceutical companies are struggling to adopt intellectual property (IP) models that are closer to the semiconductor space – IP sharing, cross licensing, etc -than their traditional models (completely in-house with secretive development) to simply keep up. Immersion photolithography (193 nm) technology requires an in-depth understanding of water interactions and membranes. Membrane technologies are needed to successfully remove arsenic and boron from the water supply. Work on dye filtration has shown promising results in building membranes with feature sizes on the 0.1 nm (1 A) scale to provide the needed selectivity. Car batteries with a 400 to 500 mile range. Existing lithium ion (Li-Ion) batteries do not have sufficient energy density and would require a 5 to 10x improvement. However, lithium air (Li-Air) batteries do have a sufficient energy density but they are not rechargeable. By changing the catalysts – using organic compounds as reaction promoters instead of metal catalysts – it is possible to develop Li-Air batteries that can be recharged. PET plastic is mechanically recycled today in to other materials. By using organic catalysts it is possible to recycle it back to original starting material to form new PET items. Sequestration of CO2 to useful polymers is possible instead of pumping in to the ground for “storage” as others now propose. Most cancer drugs are hydrophobic causing very toxic side effects. If the hydrophobic nature of the drug can be shielded until it is at the target site this would significantly reduce the side effects. Insulin needs to be injected into the bloodstream as the pH of the stomach would destroy it. If a structure could be built that opens (dissolves) over time the insulin could be released in the small intestine (where the pH won’t destroy it) thereby creating an oral version. Super sensitive magnetic sensing could enable building of assay arrays with single cell antibodies. If the sample under test had magnetic nano-particles bound to it, the antibodies that it reacts with in the assay array could be identified by finding the magnetic particles. This would substantially reduce the quantity of material required to build the assay arrays. The processes, materials, and tools of the semiconductor industry may not be directly transferable to other areas. However the examples provided clearly demonstrate that the knowledge and skills developed in the creation of nanotechnology are indeed applicable to solving these pressing global challenges. Note: the Nanotechnology Council often posts the presentation slides in a few days in their archive.